By the morning I was feeling much more like myself. However, I knew from skiing trips that the headaches and nausea would return in the afternoon until my body was acclimatized. I made it a priority to take the day as easy as possible. My mind was full of fears. What if I couldn't acclimatize in time? Would I have to sit-out the summit attempt? What if the nausea is worse tonight since we'll be camped higher? As we slowly trudged along my mind went down the rabbit hole, and my mental game began to suffer. I was crabby and short with my fellow climbers. The climb out of Moir Hut Camp got our heart rates going pretty quickly. Some sections required a light amount of scrambling—one of my favorite activities. Almost directly in front of the do not litter sign we caught two climbers from another party littering. Boy did we let them have an earful. Mid morning the weather turned on us and it began to drizzle. I put the camera away and broke out the rain gear. It was still soupy and gross when we arrived at the iconic lava tower: A spire of cooled lava that rises a few hundred feet above the mountain's slope. I could tell the I was barely coping with the effects of the altitude. I struggled to consume my lunch and was terrible company. To be fair, the day was quite miserable. 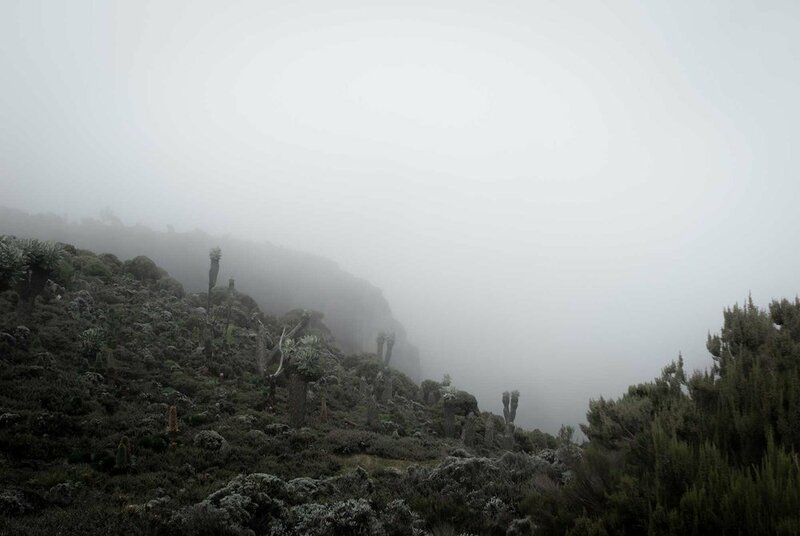 A thick cloud descended on the mountain and we were sitting on a lava outcropping eating a cold boxed lunch while the damp weather slowly worked its way through our layers. The clouds rolled in mid morning. Marc and I caught each other taking candids of one another. 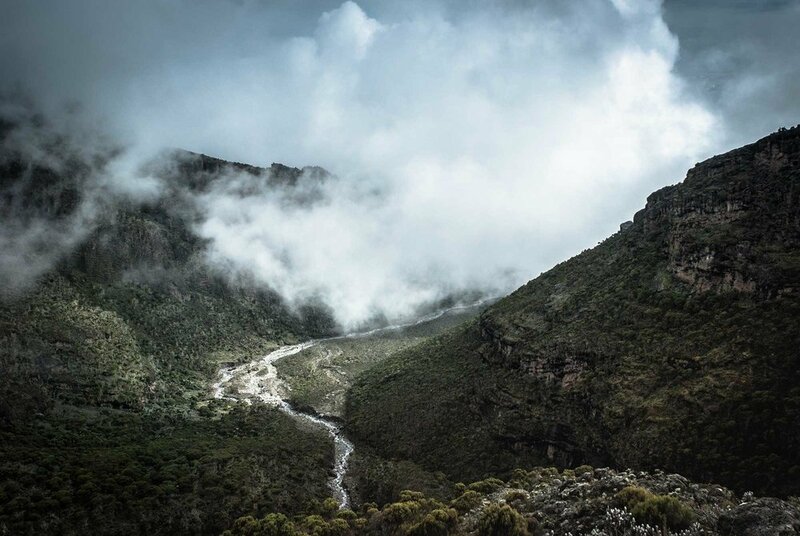 The Barranco Wall is a formidable lava ridge hikers must climb using a series of switchbacks. It was the steepest portion of the trek. 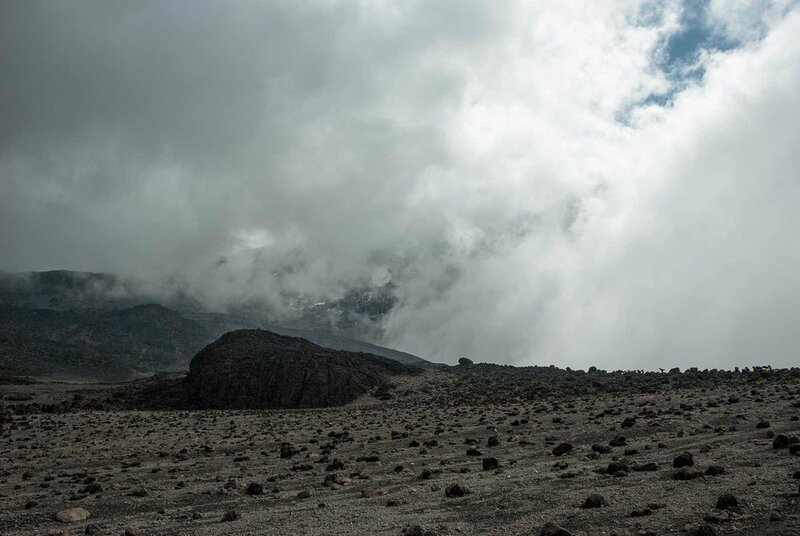 Finally at Barranco Camp, the clouds began to lift rewarding us with incredible views of the valley below the camp. 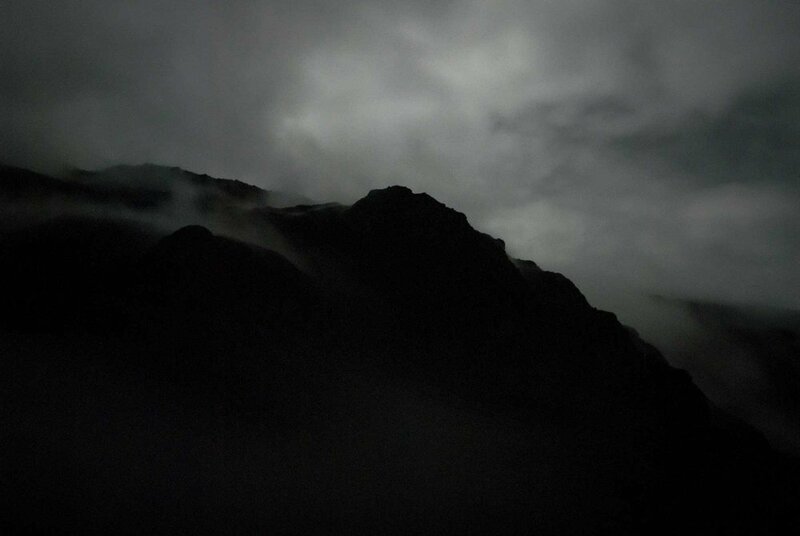 The sun was short lived as the evening clouds rolled in on schedule, shrouding the entire valley in mist. Like a zombie, somehow I managed to trudge into Barranco Camp. The hiking distances were getting shorter now that we were increasing our altitude, so there was still plenty of time before sun down. 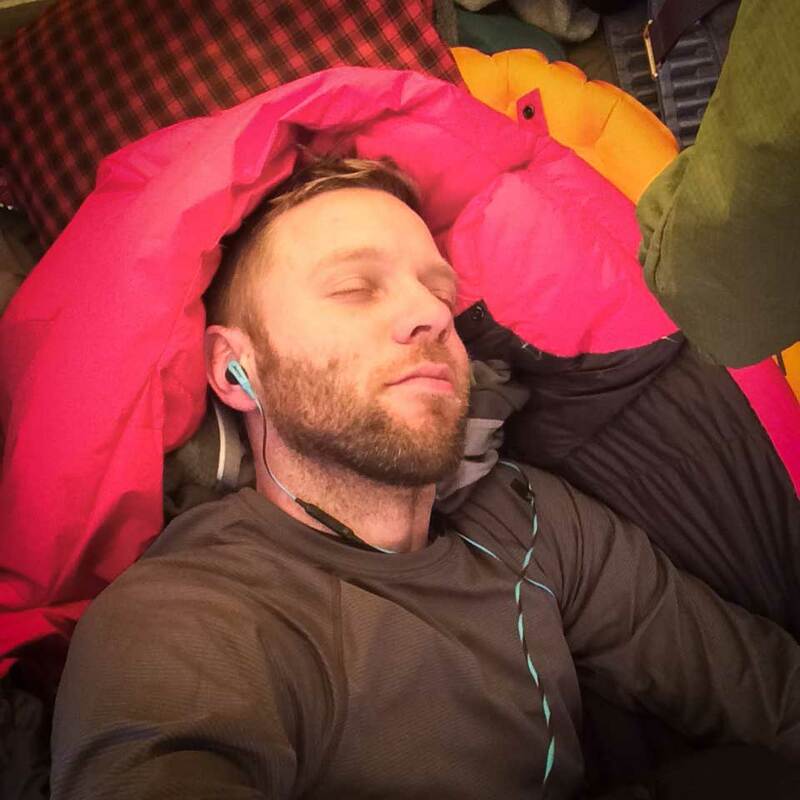 I poured myself into my tent and passed out, skipping the afternoon snack. Hours later I felt quite a bit better, but was still very nervous about my chances of completing the hike. The following day's hike would not be insignificant. 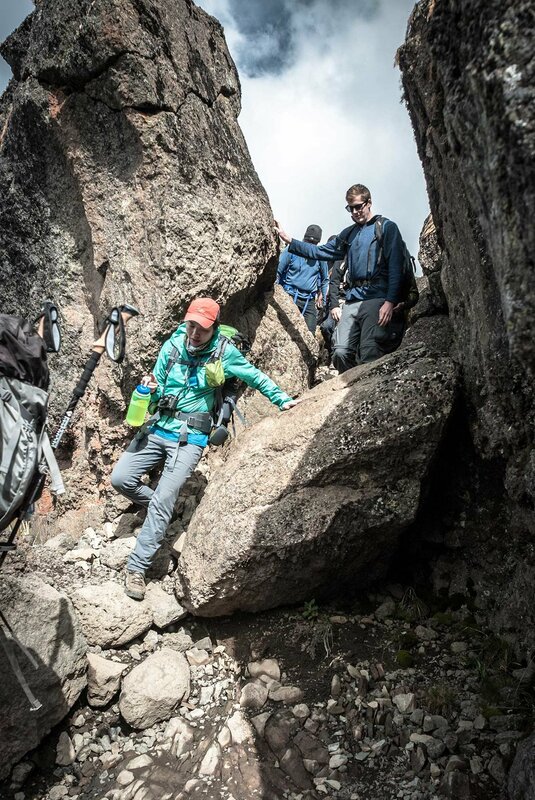 Our team would scale the Barranco Wall, a 3,000 foot bluff of hardened lava that our trail switchbacks up and over. But this was a problem for the following day. I managed to eat a healthy portion of dinner and snap a few long exposure shots of the clouds swirling around Kibo and the Barranco Wall before turning in for the night. Sometime in the middle of the night Heidi woke and exited the tent. Our fortunes were about to reverse. Welcome to the fourth day of our eight-day Kilimanjaro climb. If you’re just tuning in, you may want to start at the beginning of the adventure.